If you’re idly conversing with someone you don’t know well, the weather is usually a safe topic. It affects everyone in some way, so it’s a shared experience – but there’s something else, too. The weather is no one’s fault. It is what it is, so you need not worry that the other person will blame you for it. None of us can control the weather. And lately, the weather has been interesting, unless you had to live through its more extreme manifestations. Then it’s been hell. Before this week, I would’ve said that Harvey and Irma wrought devastation in Texas and Florida. But then Maria thrashed Puerto Rico and took devastation to a whole new level. I have a lot of friends who live in Puerto Rico, and I’m not sure how things are going to go for them over the next few months. We can prepare for storms when we know they’re coming, but we can’t stop them in their tracks or change their path. That’s true for both hurricanes and the public pension problem I wrote about last week. Where pensions are concerned, we have the financial equivalents of weather satellites and hurricane hunter aircraft feeding us detailed data. We know the barometer is dropping fast. The eyewall is forming. But we can’t do much about the growing storm, except get out of the way. Problem is, the coming pension and unfunded government liabilities storm is so big that many of us simply can’t get out of the way, at least not without great difficulty. This holds true not just for the US but for almost all of the developed world. Financially, we’re all trapped on small, vulnerable islands. Multiple storms are coming, and evacuation is not an option. All we can do is prepare and then ride them out. But as with recent hurricanes, the brewing financial storms will have different effects from country to country and region to region. I did a lot of thinking after we published last week’s letter – especially as I was reading your comments – and I wished I had made my warning even more alarming. Being a Prophet of Doom doesn’t come easily for me; I’m known far and wide as “the Muddle Through Guy.” I think the world economy can handle most anything and bounce back, and I still believe it will handle what’s coming over the horizon. But some parts of the economy won’t bounce at all. Quite a few people will see their life savings and ability to support themselves utterly disappear, or will be otherwise badly hurt, and through no particular fault of their own. I mentioned last week that the next few issues of Thoughts from the Frontline would outline my vision for the next two decades. We’ll get back to that next week. But today I want to continue with the hard-hitting analysis of our public pension problems and say more about personal storm preparation. We all have some very important choices to make. As I’ve said, the state and local pension crisis is one that we can’t just muddle through. It’s a solid wall that we’re going to run smack into. Police officers, firefighters, teachers, and other public workers who rightly expect to receive the retirement benefits that their elected officials promised them are going to be bitterly disappointed. And the taxpayers of those jurisdictions are going to complain vigorously if their taxes are raised beyond all reason. Pleasing both those groups is not going to be possible in this universe. Maybe in some alternate quantum alternate universe where fuzzy math works differently and lets you get away with stuff, but not here in our very real world. It just can’t happen. So what will happen? It’s impossible to say, exactly, just as we don’t know in advance where a hurricane will make landfall: We just know enough to say the storm will be bad for whoever is caught in its path. But here’s the twist: This financial storm won’t just strike those who live on the economic margins; all of us supposedly well-protected “inland” folk are vulnerable, too. The damage won’t be random, but neither will it be orderly or logical or just. It will be a mess. Some who made terrible decisions will come out fine. Others who did everything right will sustain severe hits. The people we ought to blame will be long out of office. Lacking scapegoats, people will invent some. Worse, it will be a local mess. Unlike the last financial crisis where one could direct anger at faraway politicians and bankers seen only on TV, this one will play out close to home. We’ll see families forced out of homes while neighbors collect six-figure pensions. Imagine local elections that pit police officers and teachers against once-wealthy homeowners whose property values are plummeting. All will want maximum protection for themselves, at minimum risk and cost. They can’t all win. Compromises will be the only solution – but reaching those unhappy compromises will be unbelievably ugly. In the next few paragraphs I will illustrate the enormity of the situation with a few more details, some of which were supplied this week by readers. 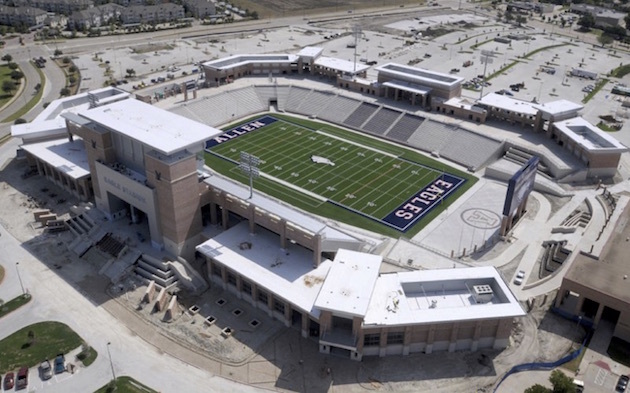 One reader noted that he has no sympathy for Houston when right next door, Katy, Texas, is building a $72 million football stadium for its high school. Allen and Katy, coupled within contrast to Dallas and Houston, illustrate what I mean by the uneven distribution of state and local pension problems. Allen had 8,000 residents in 1980 and only 18,000 in 1990. The police department in this peaceful rural town was small in those days, and the pension benefits that built up were insignificant for a town that numbers over 100,000 today. But that’s 100,000 and growing. Allen lies in the path of massive growth spilling over from North Dallas into Plano, Frisco, McKinney, and then Allen. The city could easily double in the next 15 years. Estimates are that 10 million people will move to the North Texas area within the next 30 years, which will double or triple suburban-city and public school revenues from taxes. At times, Frisco has been the fastest growing city in America. This year, Money magazine proclaimed Allen the second-best place to live in America. Residents of Allen don’t have to worry about legacy pension issues, because the town is growing faster than whatever pension issues they have. So when my reader says he doesn’t feel sorry for Houston because Katy built a $70 million high school football stadium, he needs to realize that Katy doesn’t have Houston’s legacy pension problem. Nor its high crime rate, nor all its other big-city problems. And this urban vs. suburban situation is mirrored across all the United States. The big inner cities have these monstrous legacy pension problems; and the suburbs, which have prospered on the back of the growth that has come from the big cities, feel no obligation to pitch in and help. Residents of Houston and Dallas (and Chicago and New York and LA and on and on), on the other hand, are going to feel pain. Their taxes will keep going up, while their populations will continue to flee to the surrounding suburban areas to escape those crippling taxes and high real estate costs. The LAPD ranks have fallen below the 10,000 achieved in 2013. But the city requires a force of 12,500 to perform effectively… A key factor which limits how much can be budgeted for police services is the city’s share of pensions costs. They consume 20% of the general fund budget, up from 5% in 2002… It is difficult to increase the level of service while lugging that much baggage. What about subway service in New York City? The system is fraying under record ridership, and trains are breaking down more frequently. There are now more than 70,000 delays every month, up from about 28,000 per month five years ago. The city’s soaring pension costs are a big factor here as well. According to a Manhattan Institute report by E.J. McMahon and Josh McGee issued in July, the city is spending over 11% of its budget on pensions. This means that since 2014, New York City has spent more on pensions that it has building and repairing schools, parks, bridges and subways, combined. There are many large, older cities where there are more police and teachers on the pension payroll than are now working for the city. That problem is compounding, as those workers will live longer, and the pensioners typically have inflation and other escalation clauses to keep their benefits going up. Further, most cities do not account for increases in healthcare costs (unfunded liabilities) that they will face in addition to the pensions. Candidly, this is just another “a trillion here, a trillion there” problem. Except for the fact that the trillion dollars must be dug out of state and local budgets that total only $2.5 trillion in aggregate. Now, add in the near certainty of a recession within the next five years (and I really think sooner) and the ongoing gridlock in national politics, plus the assorted other challenges and crises we face. I won’t run down the full list – you know it well. I’ll abbreviate since this is a family e-letter, but I just have to wonder, WTF are we going to do? You know I don’t light my hair on fire every time someone says “Crisis!” I believe that most of the time, most of us will be fine. Together we have enough spare resources to help the people who really need it. However, as I look out into the future I see an extraordinarily wide gap between the crisis I’ve been describing and the golden age that I truly think is coming, post-crisis. No one will find that gap easy to cross. Some of us won’t make it. Others won’t even try because they won’t see the need. They think the future will look like the past. It won’t. Personally, I intend to make it across the gap, and I want you to get there, too. The rewards will be magnificent, but attaining them will take extensive preparation. What should you do? I’d like to give you a 10-step checklist of all the steps you should take… but I can’t. Your situation isn’t like mine, nor is your neighbor’s situation like yours. We each have our own unique combination of talents, experience, resources, family structures, location, and more. The best I can do is to help you see the world as I see it. And then give you some of the resources you need. Once you have them, your answers will develop naturally. You’ll be able to prepare as I would if I were in your shoes. You’re taking step one right now by reading this letter. I hope you’re a regular reader. (I know the letter’s length got a little out of control the last couple of years. My partners and editorial team have impressed upon me the need for brevity.) So, keep reading Thoughts from the Frontline for my latest thoughts. And consider subscribing to the great analysis from the rest of my Mauldin Economics team – Patrick Watson, Jared Dillian, Patrick Cox, Robert Ross – we’ve got a deep bench! Reading our analysis and recommendations helps, but it’s not enough. You have to act on it, which means you have to be confident at a deep, personal level. How do you get there? A few months ago, my Mauldin Economics colleague Patrick Watson cited Harvard research on travel’s cognitive benefits. It seems that leaving your normal environment actually makes your brain work differently. Because you don’t know what to expect, every little act becomes a problem-solving exercise. This promotes creativity and cognitive flexibility. With that research in mind, Patrick speculated that my extensive travel might be what sparks my energy and creativity. I don’t know for sure, but it makes a certain sort of sense. Some of my best ideas come to me while I’m on the road. Maybe seeing new places and meeting new people activates neurons I don’t normally use at home. Getting together with people who are trying to think through the coming crisis is one of the most important things you can do. Being in a place with like-minded people who are all seeking solutions is extraordinarily productive. There is a reason the most successful investors and “family offices” regularly get together at conferences and share ideas. The open sharing and debate helps focus our critical thinking. And understand, SIC is not just about understanding the coming crisis. It’s about looking at new opportunities. The world has a fabulous abundance of opportunities for investment and diversification that are outside of the traditional money management space. If you are using a buy-and-hold, 60/40 typical portfolio as your basic investment approach, it is my personal opinion that you are not going to be happy a few years down the road. You really, really need to understand that past performance of the markets (for the last 70 years) will not be indicative of future results. The world is going to change in fundamental ways that we can’t predict but can prepare for. We are going to need to make course corrections and adapt on the fly. If you or your investment advisor can’t do that today, you need to rethink how you’re approaching your future. Having a secure shelter doesn’t make storms any less dangerous, but it does make them less dangerous to you. Every week you put off preparing, you are running out of time to build and stock that shelter. When I was a kid, there was a tornado shelter next door, where the local neighborhood came together when the siren sounded. We lived in Tornado Alley. I distinctly remember looking up at the sky in Bridgeport, Texas, and seeing two tornadoes, not just one. At nine years old, I wanted to stay and watch. I was completely fascinated! My mother wisely hauled me off to the shelter. What I’m telling you is that the Great Reset is going to make the recent Great Recession look like a volatility picnic. Add in massive technological and demographic shifts. And the future of work? 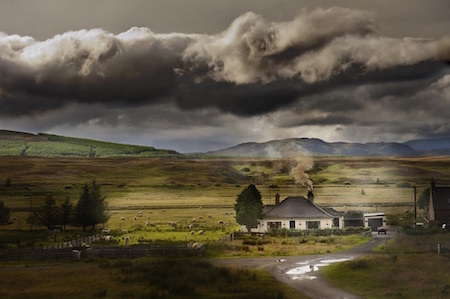 There’s another vast, turbulent, murky cloud right up ahead. But let me make this emphatic point: The world is not coming to an end. It is simply changing faster and in a more extreme fashion than we have seen in the past. For those who take the proper precautions, the future is going to be exhilarating and highly rewarding. My personal mission is to help you earn that fabulous future for yourself. Don’t be a nine-year-old kid, immobilized, gawking at tornadoes. Figure out how to build your own storm shelter, not just to withstand the coming crisis but to take advantage of the opportunities that the crisis (and ultimately the Age of Transformation) will present. The Strategic Investment Conference will help you with the knowledge and the motivation to take the next critical steps. I look forward to seeing you there. I will be in Chicago the afternoon of September 26, meeting with clients and friends, and then I’ll speak at the Wisconsin Real Estate Alumni conference the morning of the 28th, before returning to Dallas that afternoon and flying with Shane to Lisbon the next day. My hosts are graciously giving us a few extra days to explore Lisbon, and Portugal is one of the last two Western European countries I have never been to. After this, only Luxembourg is left, so the next time I’m in Brussels or Amsterdam on a Sunday, I’m going to hop on a train and go have lunch in Luxembourg. On Wednesday morning the 27th I will be on CNBC with my friend Rick Santelli. As usual, we’ll talk about whatever’s on the top of Rick’s mind at the moment. It makes for a hellaciously fun discussion. I return to Dallas to speak at the Dallas Money Show on October 5–6. I will speak at an alternative investments conference in Denver on October 23–24 and return to Denver on November 6 and 7, speaking for the CFA Society and holding meetings. After a lot of small back-and-forth flights in November, I’ll end up in Lugano, Switzerland, right before Thanksgiving. Busy month! Then there will be a (currently) lightly scheduled December, followed by an early trip to Hong Kong in January. It looks like Lacy Hunt and his wife, JK, will join Shane and me there. Lacy and I will come back home exhausted from trying to keep up with the bundles of indefatigable energy that JK and Shane are. Shane is in New Jersey with her son, so I am home alone “batching it” for a few days. Food preparation has been a little less extensive, shall we say, but the schedule is no less busy. It’s hard to believe, but in less than two weeks I turn 68. I don’t feel the way my 30-year-old self thought I would at 68. I still think and breathe the future optimistically, if perhaps with a more cautious outlook; but I really do think that the world in general will Muddle Through and that you and I can thrive. OK, it’s time to hit the send button. Have a great week. And maybe sit down with friends and talk about how they see the future and what they are doing to plan for it. Share your own ideas. Who knows, maybe you’ll end up helping each other in a big way. FRANKFURT — Europe has taken a small step in its long march toward economic normalcy. The European Central Bank said on Thursday that it had pondered how to wind down its easy money policies, an enormous stimulus program aimed at promoting growth and inflation in the eurozone. But the bank also postponed a decision on when it would actually do so, and will likely decide at least some of the details at its next meeting in October, the bank’s president, Mario Draghi, said. Even though the eurozone is arguably in its best economic shape in a decade, Mr. Draghi and his colleagues on the bank’s Governing Council have been exceedingly cautious about ending the emergency measures that helped prevent the euro from self-destructing after the global financial meltdown in 2008. The Federal Reserve in the United States began raising interest rates at the end of 2015, but the European Central Bank continues to flood the 19-nation eurozone with cash as a way to reduce interest rates, stimulate growth and nudge inflation from levels considered to be dangerously low. The measures have worked, for the most part, helping the region overcome a prolonged slump. But the program — known as quantitative easing — has also had side effects, including fueling a steep rise in real estate prices in Germany that have led to fears of a bubble. Mr. Draghi said Thursday that the benefits have far outweighed any negative effects. Still, with the Fed moving in the opposite direction, the European Central Bank has been under pressure to shift its policy. He began laying the foundation on Thursday for plans to “taper” the stimulus. Although the European Central Bank’s Governing Council left monetary policy unchanged, Mr. Draghi said policy makers had preliminary discussions about the program, and said they would make the “bulk” of the decisions about tapering late next month. Yet he also left himself plenty of wiggle room in case conditions change. In particular, the central bank will be keeping a close eye on the euro’s growing strength compared to the dollar, which Mr. Draghi said could alter assumptions about how the eurozone economy will perform. “The recent volatility in the exchange rate represents a source of uncertainty which requires monitoring,” he said at a news conference. The dollar has declined more than 13 percent against the euro this year, driven largely by tensions with North Korea and dysfunction in Washington. When the euro rises against the dollar, European exports become more expensive — not only in the United States but also in other countries, like China, whose currencies are linked with the dollar. That typically means that European companies will sell fewer goods abroad, hurting growth and prolonging the need for central bank stimulus. A robust euro also undercuts the bank’s efforts to jolt inflation back to the official target of 2 percent, a level considered healthy for growth. A strong euro holds down consumer prices by making imported oil and other goods cheaper for eurozone residents. That’s not all bad for people who live in Europe, but low inflation means that Mr. Draghi has to keep printing money longer than he would like. The eurozone’s annual rate of inflation in August was 1.5 percent, and a substantial increase is nowhere in sight. According to forecasts by the central bank’s staff, inflation will still be below the target in 2019. There’s not much Mr. Draghi can do about the weak dollar, which analysts say reflects pessimism about the ability of President Trump and Congress to agree on legislation that many economists believe would help bolster growth in the United States, such as infrastructure programs or corporate tax reform. “Investors no longer trust the American government to push through tax reform and fiscal stimulus,” Alwin Schenk, a portfolio manager at the German bank Sal. Oppenheim, said in a note to clients. The dollar’s decline is also an expression of the nervousness investors feel about geopolitics, primarily nuclear saber-rattling by North Korea and bellicose rhetoric from Mr. Trump. The euro is seen as a safe haven from turmoil. In addition, investors have sold dollars and bought euros after becoming more optimistic about the eurozone’s prospects for growth. Mr. Draghi may have tried to talk the euro down on Thursday by stressing that a stronger currency could alter assumptions about future inflation. But if that was his goal, the jawboning did not work — the euro rose about 1 cent to $1.20 after his remarks. 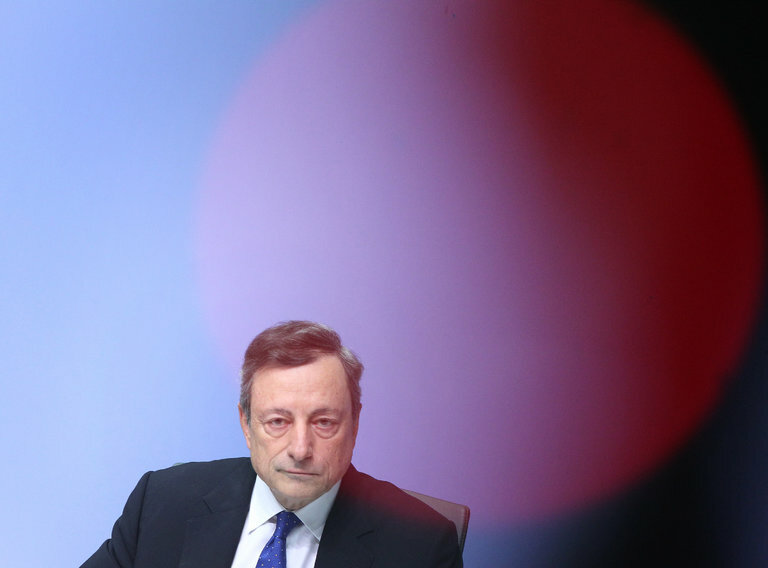 The European Central Bank is running out of time. It has been printing money for more than two years, using newly created euros to buy government and corporate bonds. It hopes to make it easier for governments to deal with their debts and cheaper for corporations to raise money that they can invest. The bank has said it will spend 60 billion euros, or $72 billion, a month in eurozone bond markets at least through December, but has not said what it will do after that. Mr. Draghi reiterated Thursday that it would not raise its benchmark interest rate, currently zero, until it has ended the bond purchases. That means rate increases are probably still years away. There may be another reason the European Central Bank must dial back the stimulus — the supply of bonds may be getting scarce. When it announced its quantitative easing program, the bank promised not to buy more than 33 percent of any one bond issue, to avoid distorting the market too much. The limit is also designed to protect against legal challenges by critics who say the bond buying is illegal because the central bank is barred by law from using its printing presses to finance eurozone governments. Many analysts believe that it is becoming increasingly difficult for the bank to avoid exceeding the limit for German Bunds and other kinds of bonds because it has already bought so many. 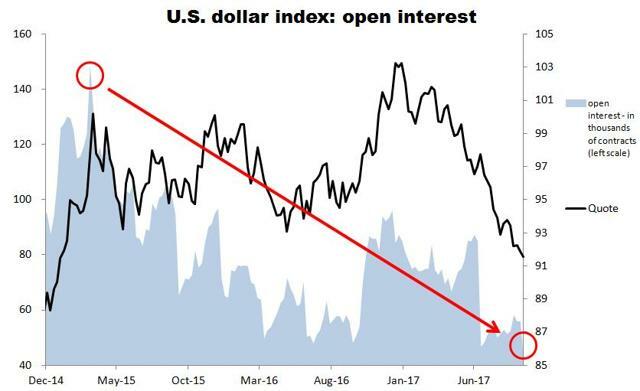 The U.S. Dollar Trade Is Dead Now - What About Gold? - In my opinion, if a bullish thesis about gold is correct, the current correction in gold prices could be over now. - Although the last Commitments of Traders report is of poor predictive value, the signals delivered by a few other indicators (discussed in the article) support this scenario. - The US dollar could be a significant risk factor for gold but the US dollar trade is dead now. - As a result, the signals sent by the greenback are of small predictive value as well. The first part of this statement was fulfilled - last week gold and silver prices dropped substantially (2.1% and 4.1%, respectively). The second part of the statement is being tested now – gold prices hold around their strong support at $1,300 per ounce. 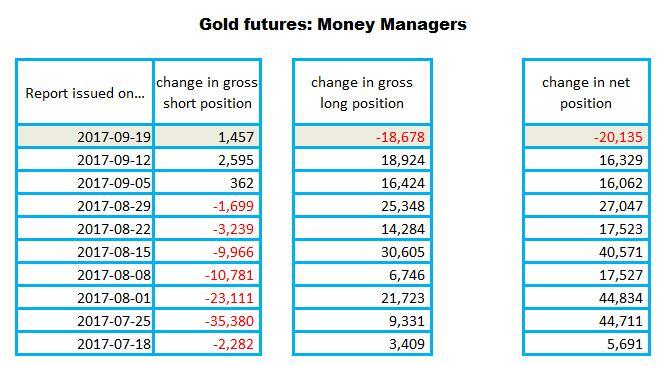 Note that last week Money Managers cut their long position in gold futures by 18.7 thousand contracts (the row marked in grey) – it was the first such a large cut since the beginning of the current bull stage in gold (July 2017). Is the correction over now? 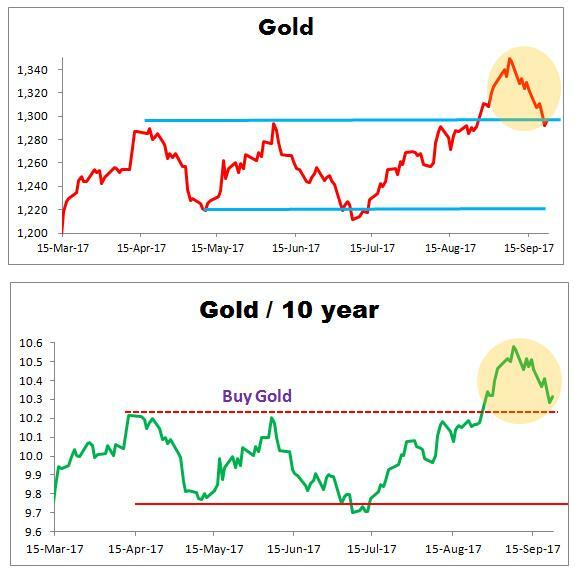 As usual, I have no idea but predicting the gold market (and other financial markets) has nothing to do with having the idea. Simply, it is just pure mental speculation about the future. 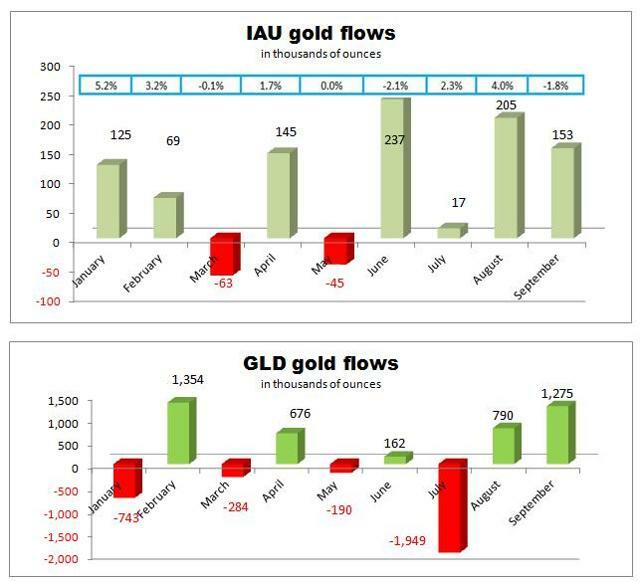 The charts show gold flows reported by GLD and IAU (the row marked in blue depicts monthly changes in gold prices). As a rule, when gold is in its bull stage both investment vehicles report gold flows. And vice versa. This year, however, the pattern is more complicated. At least the one drawn by GLD. For example, in July gold prices went up by 2.3% but GLD reported outflows of gold (the largest outflow reported this year – 1.9 million ounces went out of GLD in July). Well, not everything goes strictly according to the rules. Investors are confident that the bull market in gold is going to last. 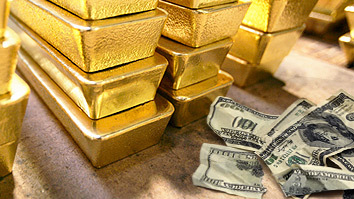 A substantial drop in gold prices is considered as a buying opportunity. As long as gold prices are around their strong support at $1,300 per ounce, the investor’s confidence is well-grounded. What is more, the exceptions discussed above are very rare. Hence, the message delivered by this exceptional event is even stronger. Note that the current correction in gold prices (the upper panel of the chart and the area marked in yellow) brought the ratio to its support. The old resistance (the dotted, horizontal line on the lower panel of the chart) is the new support now; so, in the short term, I expect that gold prices should bounce off that level or enter a consolidation pattern. The US dollar is still in its bear market phase, which is good for gold. On the Fed announcement the greenback had strengthened significantly, but then the enthusiasm for taking long positions in the US currency dissipated. However, the actual situation will be disclosed when the next COT report is on. Note that whenever big traders were that negative about the greenback (red circles), the US currency was ahead of a major trend reversal. Now, if the US dollar starts its bull market phase, the emerging bull cycle in gold could be endangered (according to the old rule that gold and the US dollar go in the opposite direction). The chart shows the total open interest in US dollar index futures. Now this measure stands at one of the lowest levels in history – as of September 19, 2017, only 42.3 thousand contracts were in the game. Simply put, the US dollar trade is dead now. 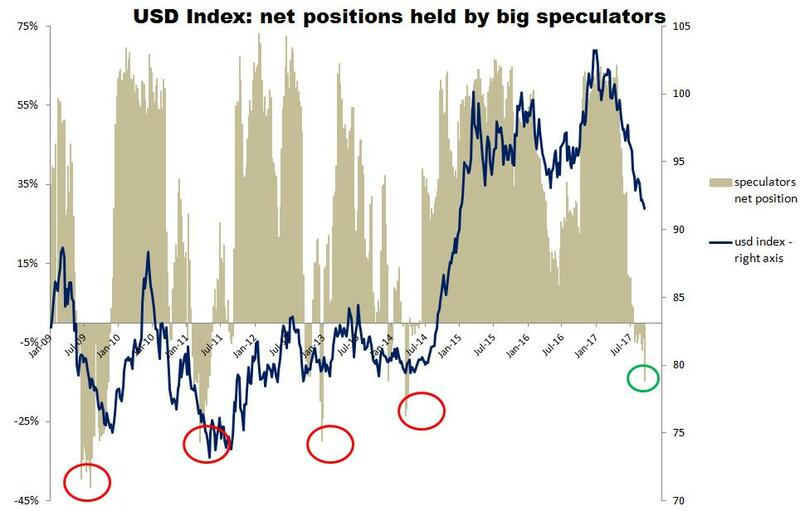 Generally, nobody wants to bet on the US dollar, no matter whether on the long or short side. As a result, the signals delivered by the dead market are of very low quality. Last week’s COT report shows the state of the markets as of September 19, one day ahead of the Fed announcement. It means that the predictive value of this report is poor. However, assuming that gold is in its bull market stage, the current correction could be over. This thesis is supported by US investors accumulating gold bullion (using GLD and IAU) despite lower gold prices. Additionally, my favorite market indicator (the relationship between gold and US 10-year treasury notes prices) is very close to its strong technical support. It’s not every day that a country finds itself in a position where one decision can shape the security framework of an entire region. At the moment, Sweden is in just such a position: It must decide whether to sign a new U.N. nuclear weapons ban. On its face it sounds fairly harmless – Sweden doesn’t have its own nuclear weapons anyway, and U.N. measures are typically ineffectual – but the responses to it tell a different story. The United Kingdom, France and Germany have all warned Sweden against signing onto the treaty, but the harshest response came from Washington. U.S. Defense Secretary James Mattis sent a letter to his Swedish counterpart threatening to end security cooperation with Stockholm if the agreement is signed. He warned that Sweden’s approval on the new U.N. convention banning nuclear weapons, including on Swedish territory, would affect U.S. defense cooperation both in general and during a crisis. He’s not wrong. In a move consistent with its stance on nuclear weapons for the past 50 years, Sweden voted in favor of the updated anti-nuclear resolution in July. Sweden ended its military nuclear program in 1965 and dismantled its last plutonium laboratory in 1972. It had started its program for the purpose of nuclear deterrence as part of its national defense doctrine, but it abandoned this outlook once it realized its efforts would encourage neighboring countries to pursue their own nuclear programs. The pursuit of safety, Sweden feared, would only make the region more dangerous. Since then, the government in Stockholm has supported the idea of nuclear disarmament, with the aim of lowering the levels of preparedness of nuclear arsenals throughout the world. What the new U.N. resolution would do – and why the U.S. and NATO allies warned so strongly against Sweden’s signing it – is ban signatories from either delivering or receiving nuclear weapons, or from stationing nuclear weapons on their territory. Air bases and sea ports could be denied to vessels (submarines, destroyers and bombers) carrying nuclear weapons such as ballistic missiles. The consequences are especially dire for the United States; U.S. military doctrine does not permit officers to disclose what types of weapons are on their vessels. In effect, all U.S. military vessels and aircraft would lose access to Swedish sea ports and air bases. This could severely limit NATO’s operational capabilities in the event of a military conflict, particularly a conflict with Russia over the Baltics. The Baltic states (Lithuania, Estonia and Latvia) occupy one of the most vulnerable positions along the Intermarium, an emerging containment line sponsored by the U.S. to keep Russian influence in Europe at bay. The Baltic countries comprise the northern limits of the Intermarium and are isolated, wedged between the Baltic Sea, Russia and very pro-Russia Belarus. Only Lithuania shares a border with the mainland, anti-Russia bloc of Europe – a mere 65 miles (104 kilometers) with Poland. In recent years, as part of its resurgence, Russia has built up its military capabilities along its western border and in Kaliningrad, its exclave on the Baltic Sea surrounded by Lithuania and Poland. Kaliningrad is equipped with a sophisticated anti-access/area denial network that includes the S-400 air defense system and Iskander short-range ballistic missiles, which have a range of just over 300 miles. Russian corvettes in the Baltic have been observed to be equipped with long-range Kalibr missiles (range of 1,600 miles) as well as the Bastion anti-ship missile system, which has an effective range of roughly 150 nautical miles. Russian bombers, fighter jets and reconnaissance planes are also based in the exclave. These forces in Kaliningrad pose a serious threat to the Baltic Sea and the Baltic states, which must rely on NATO to defend themselves from Russia. Sweden enters the mix because of an island called Gotland, which is strategically located to play a key role in the military control of the Baltic Sea. Given Sweden’s unofficial alignment with the U.S., this means mitigating aerial threats posed by weapons systems in Kaliningrad, such as denying Russia the opportunity to control the entire airspace around the Baltic states. Whoever holds Gotland is well-positioned to monitor submarine activity in the Baltics and can heavily influence the naval supply of resources and troop reinforcements to the coasts of the Baltic states (and, to an extent, to Poland). Ever since Mattis’ warning, Sweden has been backpedaling from its support for the U.N. nuclear ban treaty. The government initiated a study of the consequences of signing the agreement, allowing it to save face and take its time before making a decision. Stockholm knows that it needs outside support to guarantee its national security. Besides upgrading the weaponry deployed in Kaliningrad and the Baltic Sea, Russia has stepped up its military exercises. Sweden and the Baltic states have taken note, because past Russian land grabs – Georgia in 2008 and Crimea in 2014 – were preceded by upticks in Russian military drills in those areas. In 2013, Russia simulated two nuclear attacks on Sweden using bombers. In 2014, it sent ships and planes into Swedish airspace to probe the country’s military reaction and capabilities. The incursions confirmed what Sweden already knew: that the Swedish military had minimal operational capability and could not defend itself against a major attack. Sweden has done what it can to overcome its vulnerability on its own. It plans to increase defense spending by 11 percent by 2020 and reinstated mandatory military service. It re-established a military presence on Gotland island, and from Sept. 11-29, it will host its largest military exercises in 20 years. But the Swedish government knows that even with these steps, it can’t face down Russian threats alone, so it has cultivated stronger defense ties with NATO and with the United States. In 2014, Sweden received Enhanced Opportunities Partners status in NATO, which allows the country to have deeper cooperation with NATO without having to join the bloc. Two years later it ratified a host nation support agreement with NATO, making it easier for NATO to send troops into Sweden for training or real operations, and signed a statement of intent over joint defense cooperation with the United States. The U.S. was once in a similar situation with New Zealand. In the 1950s, islands in Oceania were popular locations for European countries and others to conduct hydrogen and other bomb tests. New Zealand opposed the practice and adopted a strict anti-nuclear weapons stance. In 1985, Auckland denied port to a U.S. destroyer because it would not verify whether it had nuclear weapons on board. The U.S. responded by banning New Zealand vessels from U.S. ports. This practice continued for nearly 30 years, until China’s rising naval presence in the Asia-Pacific began to raise security concerns for both countries. In 2012, the U.S. decided to allow New Zealand port access again, and four years later, U.S. warships were allowed back in New Zealand. Just as the threat from China forced New Zealand to change its policy, the threat from Russia is challenging Sweden’s own stance on nuclear weapons. It needs U.S. and NATO security guarantees, just as they need its cooperation – and access to Gotland island – to protect the Baltic states. In the end, they’ll likely find a way to work together. Bank stocks are experiencing technical breakdowns. This could spell trouble for the stock market. Following the election, bank stocks were among the leaders in the “Trump Trade” rally. With promises of regulation rollbacks and a rejuvenated economy, banks were seemingly the place to be. However, they stalled in March, lagged the market for months, and this week finally broke down below very important technical supports. The market was able to rally when banks were merely marking time, but now that the trends in banks are down, the game has changed for the worse. To fully understand what is happening we have to start with the U.S. Treasury market. 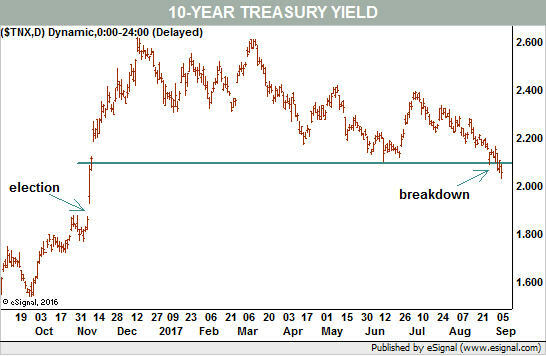 The benchmark 10-year yield also peaked in March and moved below support earlier this week (see Chart 1). At 2.06%, the market is trading where it was during the first day after the election results were tabulated. The entire gain has been lost and presumably so has the enthusiasm the bond market had for the new administration. The question investors must ask is, what does the bond market know that the stock market may be missing? If the economy is picking up then interest rates should be rising, not falling. Even more concerning is the shape of the yield curve. This is a plot of Treasury rates from short-term to long-term, and it is often used as a harbinger of economic change. To simplify the analysis, we usually just analyze the difference or spread between the two-year rate and the 10-year rate. A flat yield curve where short- and long-term rates are close often signals a recessionary tone. The last time we saw such a curve was 2007 just ahead of the financial crisis. At that time, the curve was actually “inverted” with short rates above long rates. In 2016, the curve started to get very flat again but not so flat to signal real economic problems. After the election, the yield curve also broke out to the upside, meaning it got steeper, as long-term rates started to climb faster than short-term rates. It was viewed as a positive for the economy. It was even more positive for banks. Since they borrow money at short-term rates and lend it out at long-term rates, a bigger spread between the two meant they would make more money. Therefore, it was no surprise to see this sector lead the market higher after the election. This week, for the second time this year, the yield curve is back down to its lows from 2016. Again, it does not signal a pending recession, but it does speak to the bond market’s lack of confidence that the economy will actually catch fire. The banks responded with a rather negative move as the SPDR S&P Bank exchange-traded fundKBE in Your Value Your Change Short position (ticker: KBE) traded below key support (see Chart 2). Not only is the ETF lagging the broad market, but it is solidly below its 200-day moving average. Even worse, the 50-day average also crossed below the 200-day average in what chart watchers call a black or death cross. It is a sign of a major change in the trend for the worse. The SPDR S&P Regional Banking ETFKRE in Your Value Your Change Short position (KRE) shows all the same characteristics and has been lagging the KBE ETF for months, as well. Gary Kaltbaum, president of Kaltbaum Capital Management, thinks this can be more of a problem for the market. He said that the decline in the 10-year Treasury rate is squeezing bank margins and changing perceptions of the future profits of these companies. Indeed, the biggest losers in Thursday’s market were such regional banks as Fifth Third BancorpFITB in Your Value Your Change Short position (FITB) and Comerica (CMA). 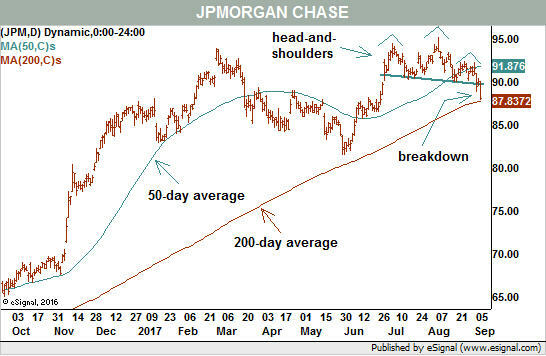 Of the larger banks, even JPMorgan Chase (JPM), which held up better than most of its peers, now sports its own set of technical failures (see Chart 3). 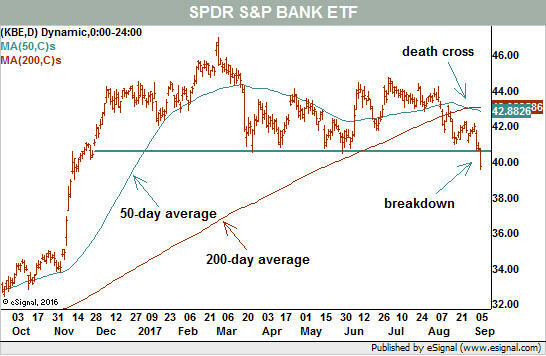 The bottom line is that the breakdown in the banks is significant not only for the sector but likely for the market, as well. The trends in the major indexes may still be to the upside, but once again warnings are starting to develop.